“What I love most about my home is who I share it with” are the words printed outside the front door of the Abbington Green Bed and Breakfast Inn. The words describe the atmosphere guests will experience while staying at the 1909 Colonial Revival home that is located in the Montford Historic District, close to downtown Asheville, NC. The Inn has been a long-time interest for Innkeeper, Nick Poulos. After collecting inn ideas for 15 years, Poulos purchased Abbington Green in 2014 with co-owner Steve Donahue. The years of planning and attention to detail immediately paid off and earned them their first AAA Four Diamond Award shortly after opening. Guest rooms of the inn are decorated with a perfect blend of English royalty and “home away from home” ambiance. Amenities include: king beds, whirlpool tubs, luxurious bathrobes, towel heaters, flat-screen televisions, fire places and tea and coffee stations complete with a Flavia brewers. 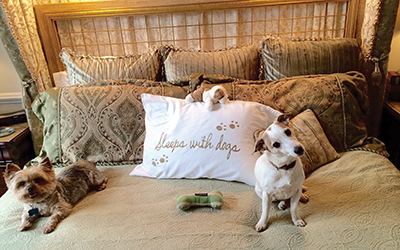 Separate from the main lodging, the Carriage House offers three dog-friendly suites. Pets are welcomed with treats, water and a complimentary dog toy. A unique touch for guest pets includes a letter from Lady Amber Abbington (the owners’ dog) wishing pets a great stay with information about the property’s dog-run, fence and benches. The property includes six amazing and award-winning gardens. Perfect for weddings, the gardens are named individually and include The Chartreuse Garden and The Oriental Garden. For breakfast, Poulos prepares meals like Baked Orange Pecan French Toast that melts in your mouth. Served on crystal and china in the formal dining room, the food is local, organic and simply delicious. VIDEO: A video is not available at this time. We apologize for the misprint.